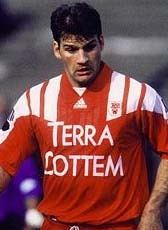 Raymond Atteveld has played for 9 professional clubs in the Netherlands and abroad. He has ended his pro-career in december 2001 after struggling from an injury. He joined the technical staff of ADO Den Haag. In May 2002, Raymond Atteveld has received his KNVB-license for coaching as professional assistant-coach or amateur headcoach. Atteveld became assistant-coach of Roda JC together with his former team-mate Johan de Kock in the season 2005-2006. When head coach Huub Stevens left the club for Germany, Atteveld became the temporary head coach. In April 2007, the club announced the news that they awarded Raymond Atteveld with a 2-year contract as head coach. In October 2008 Roda JC released Atteveld from his function. In 10 months he just managed to win two matches with his team. In April 2009 he joined his former club ADO Den Haag as head coach that last until March 2010. He continued his managerial career in Cyprus, Armenia and Kazachstan.